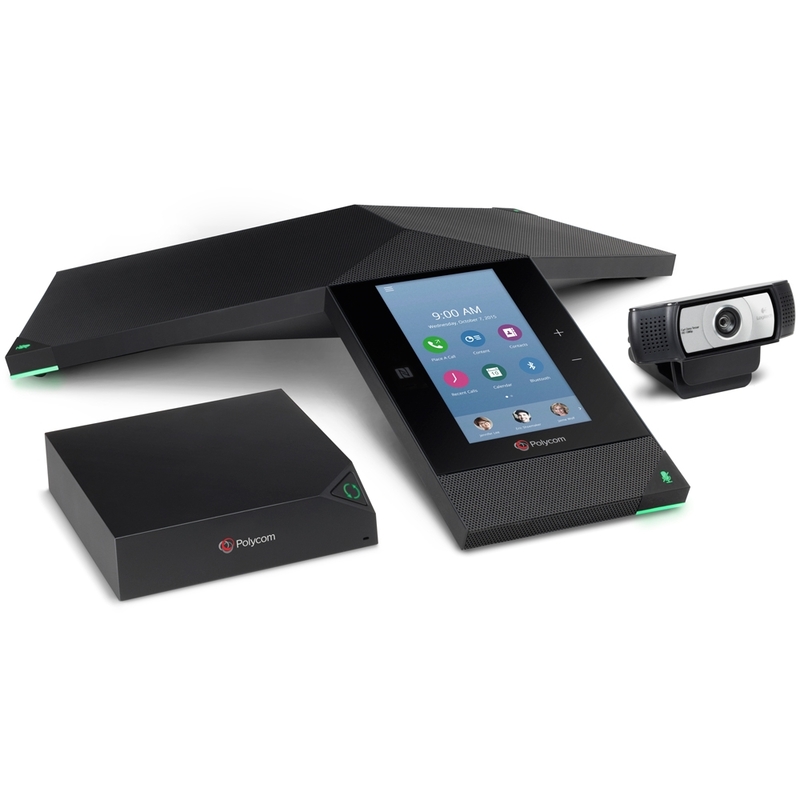 Polycom realpresence Trio is a revolutionary conference phone offering stunning room filling sound for the best conference experience ever. With a 20-foot pickup range and advanced audio technology such as enhanced Polycom HD Voice and the patented Polycom Noise Block, conversation flows, and you hear every word. It means increased productivity. A cheap conference phone may appear to be a savings at first, but the fatigue caused by audio that seems is costly in the long run. Polycom Realpresence trio models are Polycom Trio 8800 and Polycom Trio 8500. 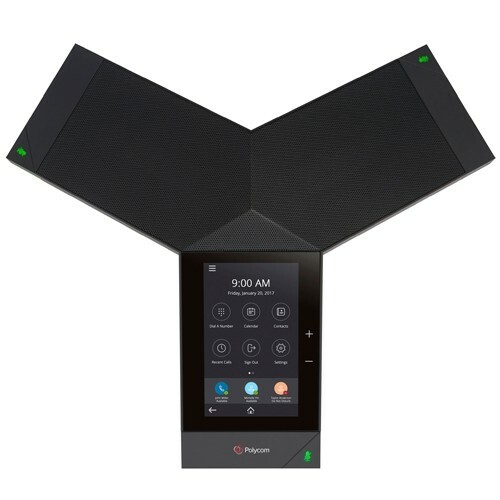 Conference system for Skype for Business environments polycom trio 8500 takes the ordinary conference call experience to the level. Getting conference calls started shouldn’t be hard, frustrating or time consuming. 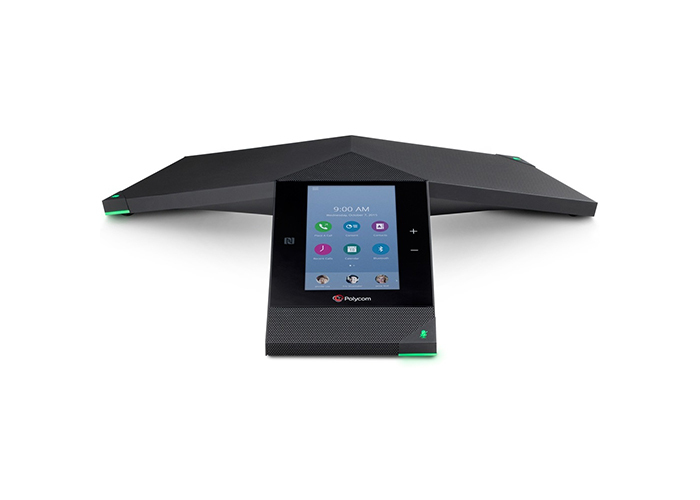 The sleek design of the Polycom Trio makes navigation simpler than ever to use. Start calls on time, every time with the same interface. You use on your Skype for Business desktop client. And with Polycom’s legendary voice quality, you can be sure every syllable is crystal clear with Polycom realpresence trio HD Voice technology. Polycom Trio 8500’s incredible system allows you to use it as a conference phone. The polycom visual and qualified USB camera, and you have a cost-effective business class video conferencing and content sharing solution ideal for huddle rooms. You can use your personal devices wired or wirelessly via USB or Bluetooth for full, rich sound using cloud conferencing solutions. Working with Microsoft,the Polycom Trio 8500 to maximize the power of Skype for Business and Office 365. Polycom conference phones can claim the Skype for Business certified distinction. Extend the simplicity of Skype for Business from the desktop to the conference room making it a consistent experience and ensuring broad user adoption. The conference phone reimagined for Skype for Business and Microsoft Office 365 Cloud PBX Polycom Trio 8800 is the conference phone reimagined for larger conference rooms. Marrying our world-class audio conferencing experience, with business-class video and content, the Trio connects to the leading unified communications platforms. Straining to hear the other side, echo, distracting background noise all result in wasted time, and a bit of truth in the adage time is money. A 5-inch colour touch display and intuitive, familiar Skype for Business interface minimizes training. And with Microsoft Exchange integration, scheduled meetings can get started with one touch. The join button resulting in fewer mistakes and quick starts for every meeting. Feel free to use your personal device wirelessly via Bluetooth and NFC. IP or wired via USB and experience sound quality using web-based or cloud conferencing services. Acepaq Supply all trio polycom conferencing products to Abu Dhabi – Muscat – Riyadh – Dammam – Doha – Qatar – Oman -Kuwait – Manama – Bahrain – Saudi Arabia – Baghdad – Sana’a – Cairo – Beirut – Kabul – Khartoum.